This national report from the Coalition for Juvenile Justice finds that while treatment methods for young offenders with mental health problems that rebuild families and provide intensive mental health services are highly successful, their availability is rare. 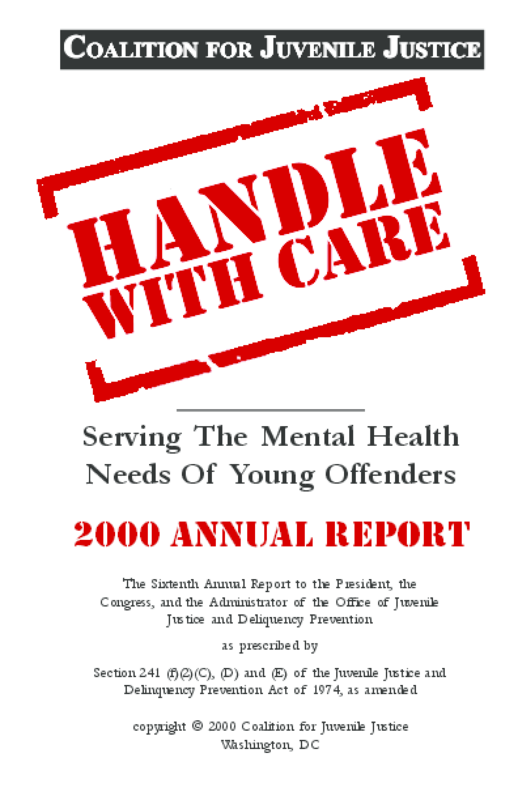 The report shows that 50 to 75 percent of incarcerated young offenders nationwide are estimated to have a diagnosable mental health disorder. It also exposes how poverty, race, gender, language barriers and sexual orientation can unjustly block young offenders' access to services. The report also profiles two model mental health service programs: Youth Villages, a private, nonprofit organization with facilities in Tennessee, Mississippi and Arkansas that incorporates the tenets of Multisystemic Therapy into its treatment; and Wraparound Milwaukee, a "full-service" approach that crafts individualized solutions for troubled children and families. These programs give youth and families chances to make positive changes, improve community safety and save taxpayer dollars.